The amazing “drawings”, created by the mix of volcanic black sand and fresh white snow, immediately caught my eye. I put a stone in the spot where I was going to take a picture the same night, hoping for an aurora to complete the scenario. 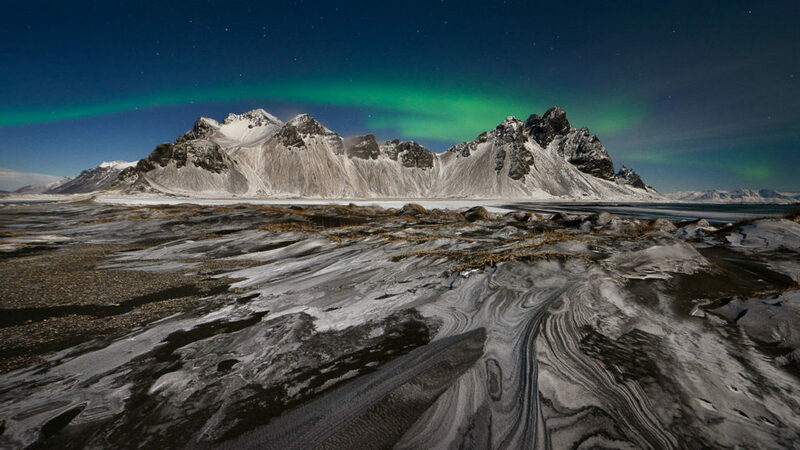 As I came back in the evening, I chose a wide angle in order to have the “drawings” as foreground and had the chance to include a green northern light that suddenly appeared over the Stokksnes Mountain at 2.00 o’clock at night.